This image was commissioned some years ago as a logo for a massage therapist. But really, it can serve many purposes. At the time I designed it, I was fascinated by the culture of the ancient Mimbres Indians of Arizona, who created amazing painted pottery. Most of these were bowls, decorated with innovative geometric and figurative designs. I fell in love with these bold yet simple circular compositions, and have used circles and spirals in my art ever since – archetypal forms that are seemingly inexhaustible. What interested me most about Mimbres bowls was that they were used for interment, or burial. When an individual died, s/he would be buried under the floor of the family pueblo, curled up in the fetal position, with a bowl over their face to provide the painted dome of a “sky” for the deceased. But to keep the person’s soul from getting trapped, the bowl was first struck to create a hole in the center. Thus archeologists unearthed hundreds of broken bowls. I thought about the symbolism of that hole, and created a heart-shaped opening at the center of my geometric spiral – with another spiral within that heart, suggesting a source that radiates both outward and inward. My client had asked for a healing design with a heart at the center. She was pleased with the result. The Mimbres people mysteriously disappeared from the face of the earth about 900 years ago, and their land became Apache land. I lost touch with the massage therapist a long time ago. But today, as we remember the timeless teachings of Martin Luther King Jr, somehow a heart spiral seems appropriate. The words of Dr. King spiral outward with a rippling effect that continues to inspire and guide people who wish to cherish the good in life, and who practice tolerance and kindness. 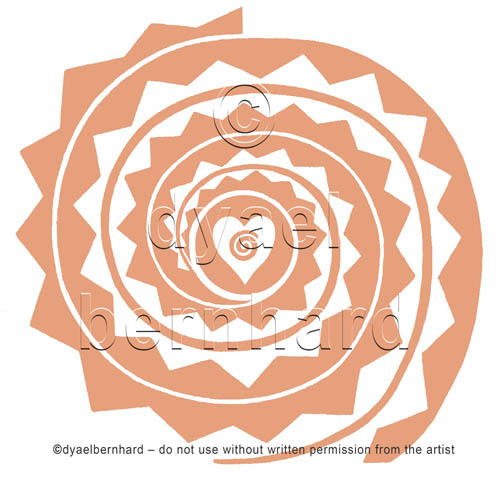 Heart Spiral can be ordered as a thank you card by clicking here. If you order this week, I’ll send you an additional card for free. If you want the card without any words, send me an email. The image is also available for licensing. 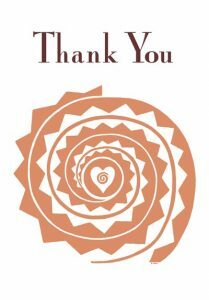 “Thank You Spiral” greeting cards are 5″x7″, blank on the inside. $3.50 each or 6 for $18 – shipping included!